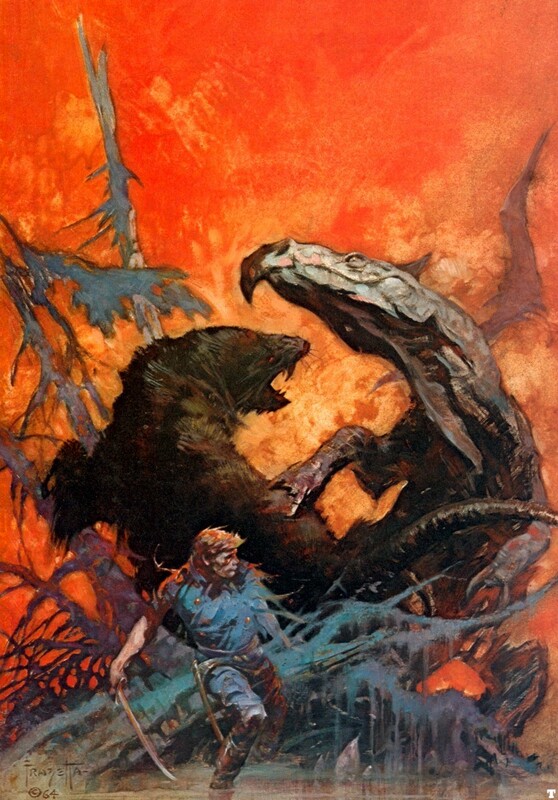 Frank Frazetta's cover for the 1965 re-release of Gulliver of Mars. Some ten years after Percy Gregg's Across the Zodiac, in 1905, Edwin Lester Arnold, a struggling british writer, published what was to be his final novel. Awkwardly titled Lieutenant Gullivar Jones: His Vacation1, it treated readers to the story of an officer who is magically transported to Mars (by flying carpet this time), which for those keeping track, that’s the third time we’re seeing this exact setup. A new development in the already well-established pattern is that once on Mars, he magically gains super strength and telepathic powers (courtesy of the utopian wave no doubt), fights warring tribes through swordplay and duels, all while being irresistible towards the beautiful, mostly naked, altogether innocent and somewhat lethargic Princess Heru. Not sooner has he fallen for her, than she is kidnapped by the thinly veiled martian version of africans, the Hither people. The diametric opposite of the pale, apathetic Thithers, the Hithers are dark skinned, war-mongering and aggressive, preying on the Hithers lazy ways, claiming whatever they want for themselves. There’s a trip down a river of death among others things, and finally a return to Earth just as the Hithers sack the city of the Thithers. Gullivar who pales in comparison to the later, heroic John Carter, neither gets the girl, nor saves the Thithers. Presumably these unresolved conflicts beckoned him back for more in the sequel, but it unfortunately never materialized as the first outing did little for Arnold’s bank account. While Arnold’s and Burroughs’s Martian heros share, there is much they do not. Arnold’s Mars is one of vast oceans, plains and jungles, contrasted with Burroughs’s Lowellian desert planet. Recall that Gullivar Jones was published in 1895, only one year after Percival Lowell first appeared on the astronomy scene. In all likelihood Lowell hadn’t yet finished theorizing about the great tragedy of the planet that dried up, and while the notion of a civilized Mars was on its way to be an accepted fact by then, it was still a sort of shadow-Earth. We projected what we knew from ourselves onto our neighbor. The desert planet wasn’t born until a few years later, just in time for Burroughs to create his take on the then age-old setup of the soldier who goes to Mars. The Hither and Thither people Gullivar Jones comes across seem obviously inspired by, respectively, the Eloi and the Morlocks from H. G. Wells’s 1895 classic, The Time Machine. The Eloi, much like the Hithers, are apathetic and uninterested in the strange traveller amongst them (hello Across the Zodiac), while the Morlocks, brutish and ape-like, keep the Eloi as livestock (no doubt eating the fairest maidens first). Wells’s book is a classic example of commenting on contemporary socio-political issues through the abstraction of science fiction, and likely grew out of the post-Looking Backwards: 2000–1887 wave discussed earlier. It’s a setup which could easily have inspired Burroughs’s races as well, although he manages to do much more with them. Arnold brings over the basic building blocks from Wells, but does next to nothing substantial with them, seemingly satisfied with delivering a juvenile tale of adventurous heroics, and scantily clad beauties2. If anything, the Hithers and Thithers could perhaps be construed as an attempt at turning Wells Eloi and Morlocks on their heads, by saying that the Morlock way of life isn’t necessarily better than the Eloi, but that might as well be conjecture as the book itself doesn’t do much to support such argumentation. Judging from the episodic nature of Arnold’s story, it seems quite reasonable to suggest that he was also quite inspired by the similarly episodic and absurdist nature of Jonathan Swift’s 1726 story: Travels into Several Remote Nations of the World, in Four Parts. By Lemuel Gulliver, First a Surgeon, and then a Captain of Several Ships, more well known simply as Gulliver’s Travels. Swift’s book was an early pre-cursor to the utopian/dystopian wave, and along with Robinson Crusoe saw innumerable imitators over the years. It’s a satire on the traveller’s tales that was so popular at the time and an exploration of humanity as seen through four different peoples. And aside from the similarities it has with both Gullivar Jones as well with other travelogue-like fantastic stories, in the context of Star Wars, it is of course worth noting that Gullivar comes across Laputa, which is perhaps the first recorded flying city in fiction, bearing a striking resemblance to a certain other flying city seen later in Flash Gordon and of course The Empire Strikes Back (initially meant for the imperial prison in A New Hope, before it was melded with The Deathstar). There is some contention over whether Burroughs even read Lester’s book, as it would seem it hadn’t been published in the US when Burroughs first published the serialized Under The Moons of Mars in 1912, which would by 1917 be novelized as A Princess of Mars. However the similarities are so plentiful, and it seems very unlikely that they would have sprung into being from some kind of wacky synchronicity, or even plain circumstance, that there isn’t much ground to stand on for any such claims. Yes, Gullivar Jones was preceded by Across the Zodiac and Journey to Mars, but the sheer number of elements unique to Arnold’s book which are also echoed in Burroughs’s make it highly unlikely that he didn’t read it. In fact he may even have gotten his idea for the title from the wording ‘Priestess of Mars’[Chapter V , 1] in Arnold’s book. “Who brought her message?” I asked, gazing vaguely round, for none had spoken to us for an hour or more. “There goes the soul of a fool!” I exclaimed and as the words were uttered the spear struck, or seemed to, between the neck and shoulder, but instead of piercing rose high into the air, quivering and flashing, and presently turning over, fell back, and plunged deep into the turf, while a low murmur of indifferent pleasure went round amongst the onlookers. Gullivar then goes on to throw a spear through the mystic’s chest without breaking a sweat, and without much of a care. It’s one in a long list of oddball scenes throughout the book (a distant cousin perhaps to the dismemberment, and killing in the Mos Eisley cantina, which seem to drew no particular attention from the patrons). These early space fantasy heroes lie quite far from the modern-day, flawed protagonists, compounded by most of them being told from the first-person perspective. It often makes them come off not so much as the unwitting stalwarts they may have been intended as, but rather as pompous, arrogant and obnoxiously self-involved. Constantly highlighting their prowess, agility and never-ending smarts. You’re as likely to want to roll your eyes at Jones and Carter as they detail their amazing exploits and the ease with which they vanquish their enemies and woo their respective princesses, as you are to applaud them. It may simply be a matter of the zeitgeist differences – though it’s carried up through Buck Rogers and Flash Gordon – but it makes reading the books something of a chore for the modern reader, and marks a crucial difference in how Star Warsapproached the genre. Gullivar Jones never did make a second trip to the red planet, as Arnold gave up writing for good when his book went nowhere. What he may have thought of the Barsoom series and its success, remains a mystery. Edwin Lester Arnold. Lieutenant Gullivar Jones: His Vacation. S.C. Brown, Langham & Co, 1905. In public domain and available as an ebook for free.